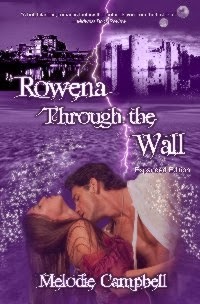 The Story behind ROWENA THROUGH THE WALL - Amazon TOP 100 Bestseller! Many people have asked me how a former comedy writer and award-winning mystery author ended up writing the Rowena fantasy series. Yes, it shocked even me. Hold on, because this story isn't funny. It was four years ago. My mother had been admitted to the hospital for the 38th time, dying. This time, she was in for seven weeks, and I was there for most of it. As the news got worse and worse, I remember looking at that hospital wall and thinking, "If I could walk through that wall into another world right now, I would." That night, I went home and started writing Rowena Through the Wall. I took notebooks to the hospital the next day. And the next. I wrote in a fever for weeks, to escape. At night, I would type the transcripts into a manuscript. Yes, fantasy. And I was a writer with a rep in a different genre. On Sept. 28, my mother's birthday, ROWENA THROUGH THE WALL made the Amazon Top 100 Bestseller list (all books.) She is no longer here, but I could swear Mom is on my shoulder right now, cheering and laughing. Time travel...what is not to love? I started this book this morning and couldn't put it down. When it ended, I almost cried out NOOOO! The minute I started reading, I was immediately drawn to Rowena and where her travels would take her. I laughed, cried, cheered her on all the way to the last page. I certainly don't want to give away any spoilers but I will admit it was the best $.99 I've ever spent. Sequel? Yes there is and now I'll order that one too since I'll certainly pay the price to pick up more of this incredible story set in Land's End. Loved this book and I'm sure you will too! ROWENA THROUGH THE WALL breaks through TOP 100 BESTSELLER LIST! ROWENA THROUGH THE WALL is now a TOP 100 bestseller! My mother died two years ago. Today is her birthday. I haven't cried since she died, but I'm crying now. 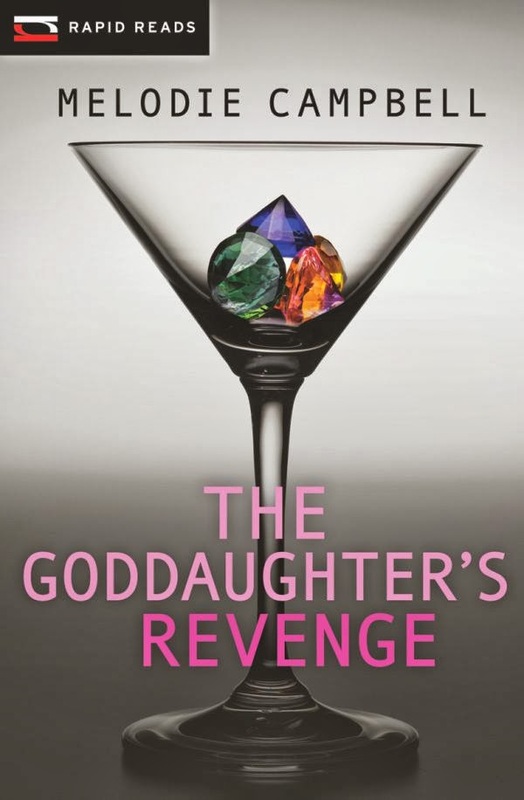 THE GODDAUGHTER'S REVENGE launches Oct. 1 in Chapters/Indigo, independent book stores, Barnes&Noble, and Amazon. Little known fact: This opening to THE GODDAUGHTER'S REVENGE scored highly in the Daphne Dumaurier Kiss of Death contest, with two judges giving it a near-perfect score. HOW TO ADD STRESS TO YOUR MARRIAGE - Novel new approaches! Hanging wallpaper together is the ultimate test of the marital bond. Unless yours is Crazy Glue, don’t do it. This is because, for one person, the hanging act is one of incredible precision, similar to what you might encounter in performing open heart surgery. It is a Challenge. It is a Quest for Perfection. Measure. measure, cut, test, test, retest – the Norman Invasion of England didn’t undergo such strategic planning. In our house, this is the same person who saves every little bit of string. Meanwhile, at the far end of the room, the other half of the team – the one who regularly throws out the Saturday paper before she has a chance to read it – is happily tossing wallpaper strips at the wall to see how they land. In the interest of marital harmony, we have devised a plan for surviving wallpaper maneuvers. In our house, one person is given custody of the level and full authority for Operation Stick-Up. The other person makes coffee and is responsible for saying “oooh” and “well done” in all the right places. Let’s face it: couples who hang together end wanting to hang each other. Unless you want added adventure to your vacation, don’t pack the car together. To wit: His technique involves using Calculus to determine the volume measure of each article to be packed, and applying each measurement to a computer mock-up of the trunk to determine efficient use of maximum space. My somewhat quicker technique involves throwing everything in at random and applying pressure. Unfortunately, doing this frequently results in our packing two cars and heading in opposite directions. Thankfully, there are some things you and your spouse can and should do together. Unfortunately, many of these lead to having children, which is something, in the interest of marital harmony, you should never do. Melodie Campbell writes funny books. The Goddaughter's Revenge is out Oct 1 in Chapters/Indigo, Barnes&Noble, and on Amazon. Welcoming Author Alison Bruce - Co-Author of HAZARDOUS UNIONS! It is my pleasure to welcome Alison Bruce to Bad Girl. All her books are wonderful, but this one is my personal favorite. Together with Kat Flannery, here are two compelling stories of living through the hell of war and finding a bit of heaven. Enjoy! Then I reread the question and saw it was “best writing advice.” Still a tough question. I narrowed it down to two things. One was more of a life lesson and is about why I keep writing: “Life is too short not to do what you love.” The other was given me by Melodie Campbell. Let me tell you, up there in the important life lesson is, have a good friend and beta reader who teaches how to write comedy. This single piece of advice has helped me fill out my plots, juice up a scene and, sometimes, get through the day when I’m getting bored standing in line at stores. Let’s face it, in life we want everything to go smoothly. We strive not to make stupid mistakes and, when we make them, we pray no one notices. Not so in fiction. As authors, we plot horrible, embarrassing, often life threatening circumstances for our protagonists. As readers we eat that up. The last thing we’re looking for is “Boy meets girl. Boy and girl fall in love. Nothing gets in the way of them getting together, including themselves.” Not only does it make for a boring story, it doesn’t even ring true. Maybe, in real life, she won’t be kidnapped by aliens and he won’t have to join the space program to save her, but something stupid will happen that will get laughed about years down the road. If they last that long. Crime writers might substitute “most likely to make the protagonist the next victim.” Adventure authors might go for “most life threatening.” I don’t write comedy, but I do adhere to the belief that “life is too important to take seriously.” Funny things happen in the worst circumstances, and almost always happen when you do something stupid. 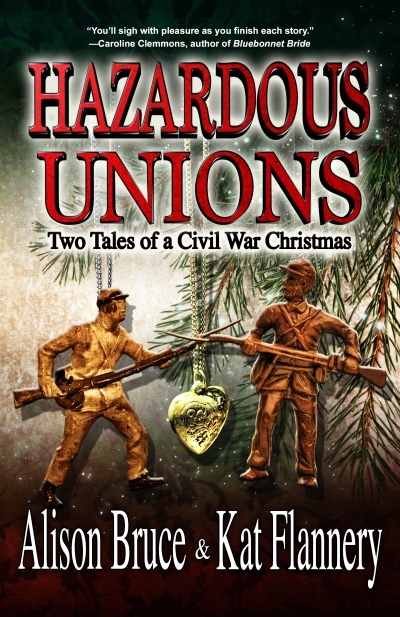 In HAZARDOUS UNIONS: Two Tales of a Civil War Christmas, Maggie does something particularly daft when she agrees to go riding without changing into appropriate clothes first. Master Sergeant patted me on the shoulder. "I'm going to let you ride Chalk. He's mine and the calmest mount I've ever had. No need to be scared." I just nodded. I wasn't scared of horses. I was very appreciative of their efforts in pulling plows and carts and enjoyed feeding them apples as a reward. I was a bit nervous about riding. My, cavalry troopers were efficient at saddling those big brutes. Master Sergeant laced his fingers and crouched down. "Just put your foot here, and one hand on my shoulder. I'll throw you into the saddle. You just have to grab the horn and swing your leg over." I followed the directions and was rewarded by the exhilarating sensation of feeling light as a feather as I was effortlessly tossed up. Then my crinoline, not being designed for saddles, popped up like an umbrella in a high wind. "Master Sergeant, what the hell are you doing?" I pushed my skirt down and saw Captain Stone, red-faced and fists clenched, and Master Sergeant looking very, very pale. It gets worse, but you’ll have to find out for yourself. 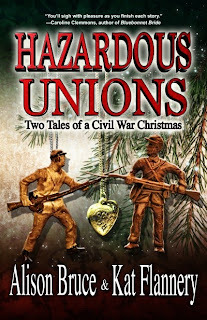 Bestselling western romance authors, Kat Flannery and Alison Bruce take you on an exciting journey with the release of HAZARDOUS UNIONS, Two Tales of a Civil War Christmas. Alison Bruce has had many careers and writing has always been one of them. 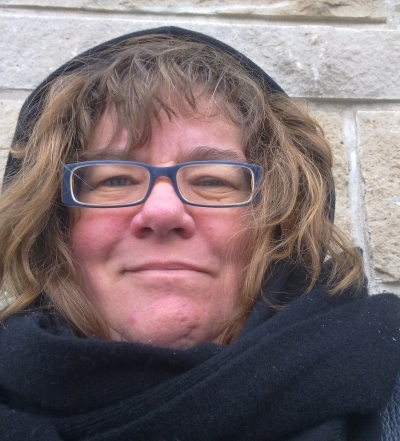 Copywriter, editor and graphic designer since 1992, Alison has also been a comic book store manager, small press publisher, webmaster and arithmetically challenged bookkeeper. 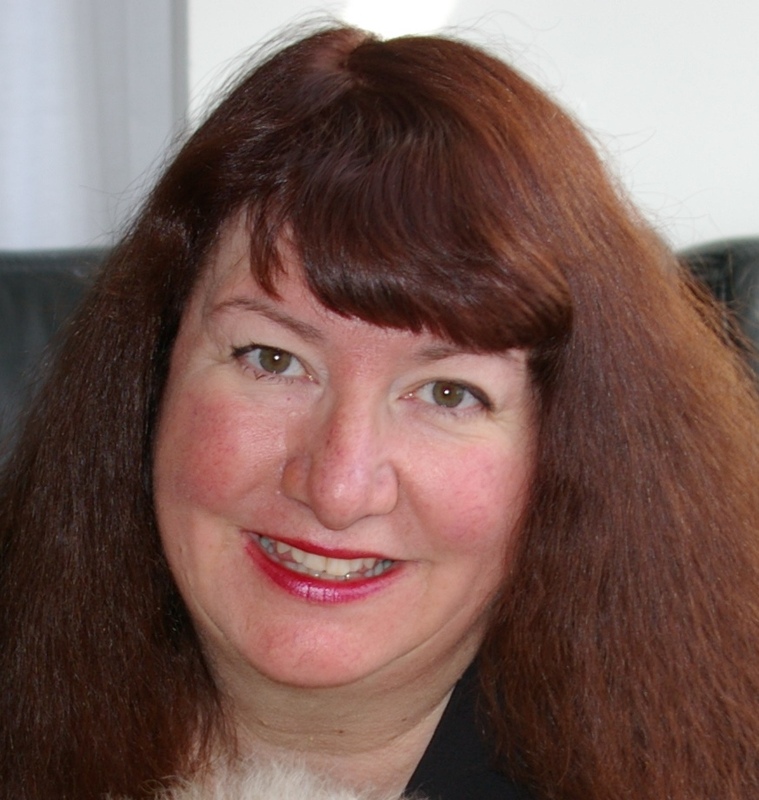 She is the author of mystery, suspense and historical romance novels and occasionally helps Melodie out of technological worst case scenarios. THE GODDAUGHTER riffs on "EIGHT REASONS WHY I LOVE HAMILTON"
1. The best cannoli outside of Italia. 2. The zaniest politics this side of BC. 3. The lake. It's gorgeous. And uncrowded. 4. The people. Friendly, unpretentious, and a tad on the lunchbox side. But man, those are good lunches, and they share them with you. 5. The weather. Hamilton is in the Banana belt. Always two degrees warmer than Toronto, our winters are milder. Snow? We pulverize it with smog before it reaches the ground. 6. The 'Mountain.' Take away the steel plants, and Hamilton looks like West Vancouver. Okay, North Vancouver. Okay, maybe I need new glasses. But it's sure pretty. 7. The roads. The lake is NORTH here, not south. To wit: the main sport in Ham is watching lost cars from Toronto try to find their way around our streets. Yes, we are fiendish that way. Don't miss Hamilton's own, THE GODDAUGHTER'S REVENGE! LIKE THE GODDAUGHTER? Don't Miss 'NOT MY BODY' ! Like the characters in THE GODDAUGHTER? Can't wait for THE GODDAUGHTER'S REVENGE? Don't miss: NOT MY BODY! It's Murder! 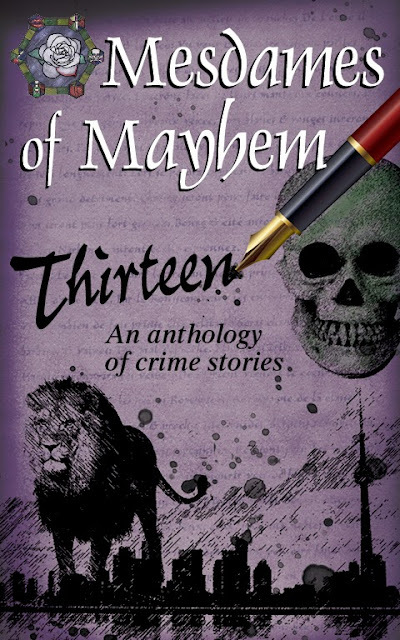 Gina and the gang return for more mob crime and comedy, in THIRTEEN... a thrilling anthology by the Mesdames of Mayhem. COMING SOON TO A SUBWAY CAR NEAR YOU! Look for these ads in the Toronto Subway, starting Sept. 27! Look for it in Chapters/Indigo, Barnes & Noble, and ONLINE at Amazon and others! I walked up to the gum-chewing school girl at the counter. She looked bored. I felt mildly sorry for her, so I decided to make her unbored. "I'm Carmine's cousin.You've got thirty seconds to take me to him before I start blowing the place. Get my drift?"